What Is New York City Like Right Now Post-Hurricane Sandy? 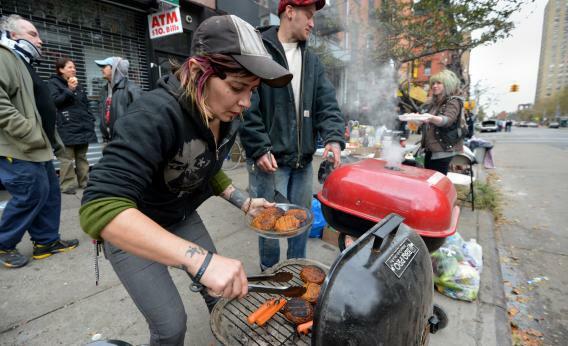 Nico Crowe cooks food to be given out to neighborhood residents on Avenue C in the East Village on Thursdayas the city recovers from Hurricane Sandy. Crowe and neighbors organized the food and a cell phone charging station. Yesterday, I walked for half a mile from my apartment to find somewhere with cell signal so I could start calling my friends (working my way Uptown) to see who had power/Internet so I could get some work done. After high 30s, I skipped to the 60s. On my way home last night, it was incredibly startling to see the city as seen from going down Second Avenue: all of a sudden, around 39th street, the lights are gone. All of them. It’s like the city just died at a line, and there are no remnants of “life” afterward. The traffic lights are gone, too, which means traffic is horrific and slow and painful. Today I tried to get four miles uptown and it took 45 minutes and $30 in a cab. But, as we always are in a crisis, New Yorkers have been friendly and compassionate and helpful wherever I’ve been. South of 39th Street, everyone drives slowly because there are no lights for the crosswalks so everyone just tries to scurry across the street wherever there is a gap in the traffic, but meanwhile the cars aren’t going more than 15 to 20 mph anyway, to avoid accidents. I get waved across streets constantly. Stores are open by flashlights and generators to sell necessities (cigarettes count as necessities). The workers at grocery stories are incredibly helpful when you walk in and ask if they have any water or nonperishables left. I’ve seen more than one group of tourists completely bewildered on the streets and a few locals giving them detailed directions where to go and where to head and how to get there. At the very least, most of my friends have reached out on Facebook offering their places to hang out or crash for anyone without power or heat or water. I can strike up a friendly conversation with anyone on the street to commiserate about what resources we don’t have. A cab driver today said that if his credit card meter didn’t work by the time we got to my destination, he would accept whatever I had in cash, it was OK (the meter worked fine, in the end). It’s interesting because during the day it almost looks like nothing is wrong, except people aren’t dipping in and out of buildings as often south of 39th Street. Lots of people are walking around, if only to get out of their apartments, where nothing works. Except you walk into and near the stores north of the cut off and suddenly you see a few weird things: people crowding around the outside of a closed Starbucks—and later you realize that all the Starbucks are closed, but their Wi-Fi is still on so people are trying to get Internet—or crowded around a corner in a Duane Reade where they’re waiting their turn to charge their phones to call people to tell them they’re OK. Some bars and restaurants downtown are still open too, generally with limited service; the day after the storm, I saw a few places open offering free coffee and (in one instance) free bread to anyone who came by because nothing else providing those was open within a nontrivial radius. Some places are open, but just serving wine and drinks and/or cold plates in low lights. I haven’t made it to alphabet city or the Lower East Side yet, where I know that several streets were completely swamped and under a foot or a few of water. I’ve seen trees torn up by their roots to the point that they’ve destroyed the cobblestones around them and New Yorkers are just calmly walking around them when walking their dogs. The one thing you see more of is people walking and trying to get signal on their phone, because a lot of the cell towers are down, so everyone has their phone out checking to see if they have service. Fewer people actually talking on the phone, though. We’re pretty resilient; we’ll be fine. How did Hurricane Sandy get its name? What is the process to drain and clean the New York subway system after the flooding? Why did so many people in New York ignore the mandatory evacuation order?